Renaissance Dyeing is a small family concern dedicated to naturally dyed hand embroidery thread and fine knitting yarns. We have a range of over 160 naturally dyed shades of fine crewel wool, French organic Poll Dorset and Merinos d'Arles 4-ply wools. The dye-house and winding machinery are housed in two converted barns in a little village in the foothills of the Pyrénées in France. 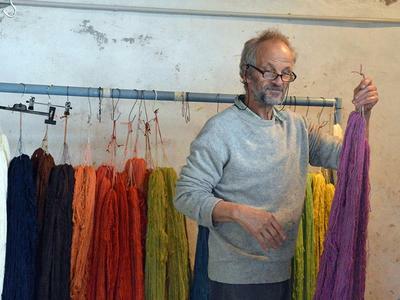 Andie Luijk does the natural dyeing and promotional work, while her husband Adriaan does the winding and labelling. Our son, Simon, has built our wonderful web-site for us and helps with its professional maintenance, without this we might not of survived in these precarious economic times. Our family is and always has been heavily involved in ecology and sustainability. Where possible the wools used by Renaissance Dyeing are from organic sources or have a low carbon foot-print. The dye plants are as local as possible and grown or harvested in a sustainable way. Only mordants with a low ecological impact are used. Renaissance Dyeing was started by Margaret and David Redpath who previously distributed these naturally dyed embroidery yarns worldwide through Access Commodities as Crewel Embroidery Wool and through Madeira Threads as Broder Wul. Margaret and David spent three decades researching and developing this naturally dyed range, using among their resources recipes from 1870 found at their mill. They also consulted with dyeing experts world wide. They further developed their dyeing skills on a number of prestigious dyeing commissions. You can find details of these under the natural dyeing projects page on this website. Since 2001 this unique venture has been run by Andie Luijk who decided to sell the yarn via specialist traders whom you will find on our outlets page and direct through our online yarn store. For centuries creative man has known that plants produce attractive, harmonious shades and have good fastness characteristics. Where possible at Renaissance Dyeing we work with real plant material, some such as madder and woad are harvested from our own garden. For the blues in the main range we use indigo and in the Elizabethan embroidery thread range, woad. Madder, Cochineal bugs, Logwood chips and Brazilwood chips are used for the pinks, reds, oranges and purples. Dried and sometimes fresh weld and fustic chips for the yellows. Oak bark, onion skins and cutch are used for browns. The colours have good fastness to washing and to light, if properly cared for (As with all textiles, do not leave your naturally dyed work in strong sunlight) See separate page on light-fastness. As each embroidery thread dye lot is individually dyed, customers should take care to buy enough of the same dye lot to finish their project, as due to the nature of natural hand dyeing, dye lots can vary.